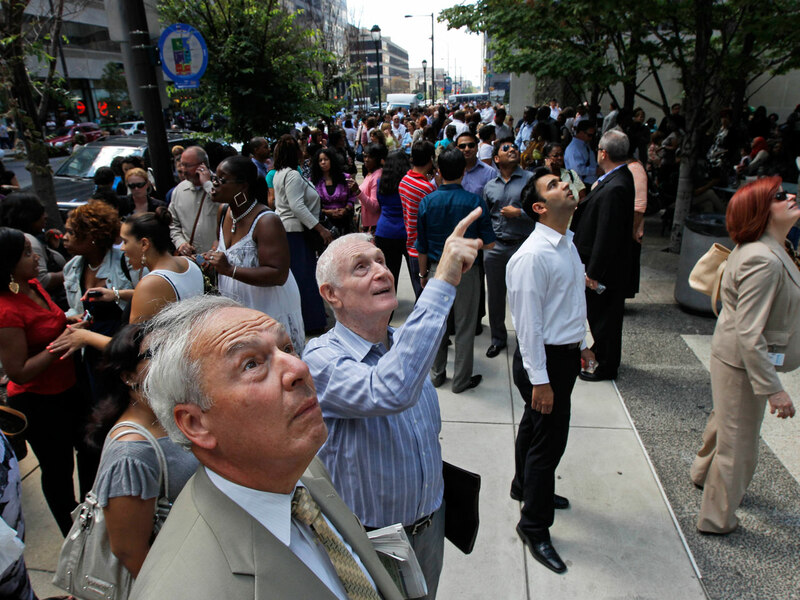 A moderate, 5.8-magnitude earthquake struck near Richmond, Va. Tuesday, causing major federal buildings in the Washington, DC area to be evacuated. There were no immediate reports of injuries or significant damage, yet the quake was felt over hundreds of miles, with reports of shaking coming in from Boston and Martha's Vineyard (where the president is vacationing) in Massachusetts, Rhode Island and New York City to the north and south into the Carolinas. One Twitter user reported shaking north of Toronto. For those of us whose knowledge of earthquakes is based on reports from seismically-active regions like California and recently-devastated Japan, it seems like a paradox. In those regions, a quake felt so far from its epicenter would likely have been catastrophic -- a 7- or 8-magnitude that caused massive damage and loss of life. There is a geological explanation. The Earth's crust beneath the Eastern U.S. is "older and colder" than out West. The fault lines are more healed. As a result, the East is far less seismically active -- but when earthquakes do hit, that hard ground is far more effective and conducting the seismic waves. "When you hit it, it rings like a bell," said Christopher Scholz a professor of geophysics at Columbia University's Lamont-Doherty Earth Observatory at Columbia University. "Even with a 5.9 you just feel it for a long, long way. There's nothing to slow that wave down." In the West, where the earth is newer and more faulted, it's more like hitting a brick. "When you get an earthquake it's sort of like a thud. The waves don't propagate as far," Scholz said. New Jersey's geological survey reports that Eastern earthquakes affect areas 10 times larger than Western ones of the same magnitude, although some geologists estimate that figure may be as great as 100-times. East Coast earthquakes remain rare, but events like this one shouldn't come as a surprise. "From a seismologists point of view-- from a long time-scale point of view -- it's not a surprise," Scholz said. "There are fault lines [in the East], but they're no longer being pushed or driven, whereas on the West Coast you're actually pushing those faults and driving them." "The likelihood of those bigger earthquakes is very low, but the effect of them is more widespread," he said.